Experienced drum teacher and pro drummer. I teach all styles, all ages and all levels of ability. Lessons are fun, creative and lead to a massive progression in the students knowledge and ability on the drums. I teach in Hampton and can travel to west and south/south west London. Electronic Drum kit and full drum kit with silencers. Berklee College of Music, bachelor of Music degree. "Dan managed to turn my son from a complete beginner to sounding like an accomplished drummer in what seemed like no time at all. My son came away very happy and excited after each lesson and was always keen each week to go to the studio and play". 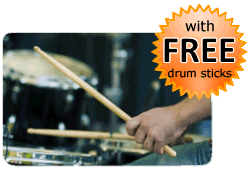 * PAY NOTHING NOW * Payments for drum lessons are made directly to Dan Graham. TRAVEL EXPENSES: If you choose for the Tutor to travel to the Student's location, the Student agrees to pay the Tutor's travel expenses. Estimated As Above. You do not pay in advance to book a drum lesson with Dan Graham via this website. The Booking Request Form on this page enables Dan Graham to get in contact with you to confirm a day and time for the drum lesson.